Interior Painters agree that interior painting is mainly used for beautifying the home and picking the right color scheme for spaces requires a certain amount of imagination and creativity. Simply thinking about what color would look best on a wall isn’t enough to ensure a positive paint job. Virtually any color will look good on a surface as long as it is applied correctly, but choosing the right color involves looking at an interior space with a critical eye in regards to your own unique taste. The easiest way to choose a color scheme is to look through color catalogues or at paint samples. Most hardware stores and paint depots keep catalogs handy for customers to take home. Homeowners and those of you that call yourselves Interior Painters should take their time looking at the spaces in these catalogs and comparing colors to their existing floors, carpets, curtains, blinds, furniture and decorations. It’s important to look at fabric and upholstery first and then look at the other aspects to see if they coordinate with your color choices. Consider the prominent color in this coordination for the walls. Once you have narrowed it down to a couple of shades you like it is best if you go to the paint store and by the little samples of the colors you are considering. Bring these home and apply 2 foot by 2 foot areas to the walls in several areas of the room or house to get a great feel for the color. You always want to do this before you hire professional interior painters because the last thing you want to do not be happy with the shade of color you pick after you pay someone or even if you do it yourself. This little bit of homework upfront guarantees success! Matte: This is a flat paint that has a calming, non-reflective effect on color. It is generally washable by may not be best for high traffic areas or in kitchen and bathrooms. Flat enamel is a similar finish and some say it is more washable then flat but this may be debatable. Eggshell: This is a more attractive version of matte. It can be cleaned and has just a tiny bit of shine. Satin: This is a favorite of doors, playrooms, trim decorations, kitchens, bathrooms and other spaces that get a lot of traffic and usage. If applied correctly, satin finish paint can withstand washing. Glossy: This finish is highly reflective and dramatic. It is preferred for modern-looking décor, and it requires careful preparations, as it does little to hide imperfections. 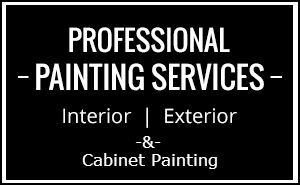 Why not hire professional interior painters for your next project?